We would recommend the MAN71 concept for all men looking for a band ring. Based on a design that has been researched for months, this men's band is durable, stylish and comfortable to wear. The ring is shown with square emerald gems but, you could request for the gemstones of your choice. It is also possible to mix different gemstones in the same ring. The ring is a quality jewel crafted by highly skilled artisans, it is set with carefully selected and custom cut gemstones. We really do not want this report to be a sales piece for our jewel. Let us highlight the main features of this jewel and present you with information, that is sufficient to make the right decision. Each ring is custom made in gold or 925 sterling silver and good workmanship. Quality standards remain the same for the silver or gold men's band ring. There are 6 pieces of 6mm square gemstone in this band ring. You can pick the gems of your choice, mixing of gems in the ring is possible. The gold band ring for men is quoted in 14k and 18k gold. The price of a 10k men's band ring can be provided on request. All 3 gold colors namely white, yellow and pink are available options. The gold band was a weight of around 25 to 30 grams. The same ring in sterling silver, weighs around 20 to 25 grams. The band width of the ring is 10mm all around, this can be customized. 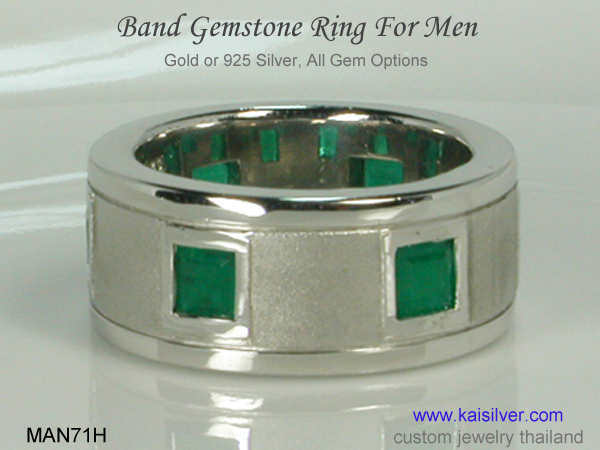 Your men's gemstone band can have a high polish or dull finish. The ring is crafted to be sturdy and long lasting with advanced features. When you invest in a high end ring like the MAN71 men's band ring, you should get a jewel that is built to be long lasting. Let us discuss the issue of durability, something which most jewelers don't care to talk about. To begin with, notice the hefty metal weight assigned to the ring. The gold ring weighs 25-30 grams and the silver ring has a weight of 20-25 grams. While we are aware that a lighter ring would be cheaper, the fact is that light weight jewels are also more prone to deforming and denting. A look at the gemstones will reveal that, they do not protrude too much beyond the surface of the band ring. This reduces the risk of the gemstones getting damaged by hitting hard objects or surfaces. A modest gem size also reduces the gemstone surface area, once again reducing the chances of gem damage. Bezel setting that consists of a metal border for the gems, is more durable as compared to prongs. It is not uncommon for prongs to open up after getting caught in pockets and fabrics. Another important piece of information related to gemstones, read this well as it is unlikely that any jeweler would explain such detail. 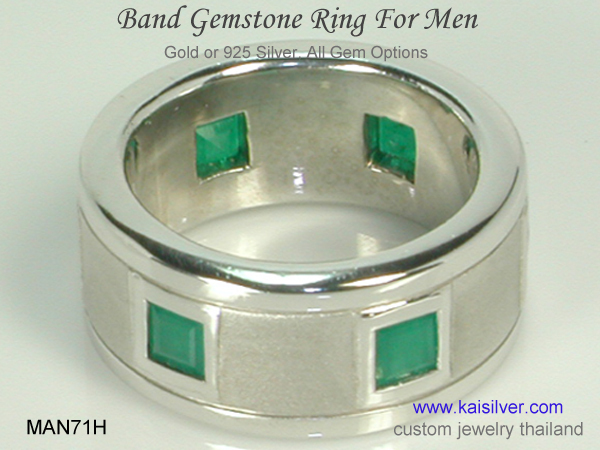 The men's band shown on this web page is set with emerald gemstones, you can choose the gems of your choice for your ring. 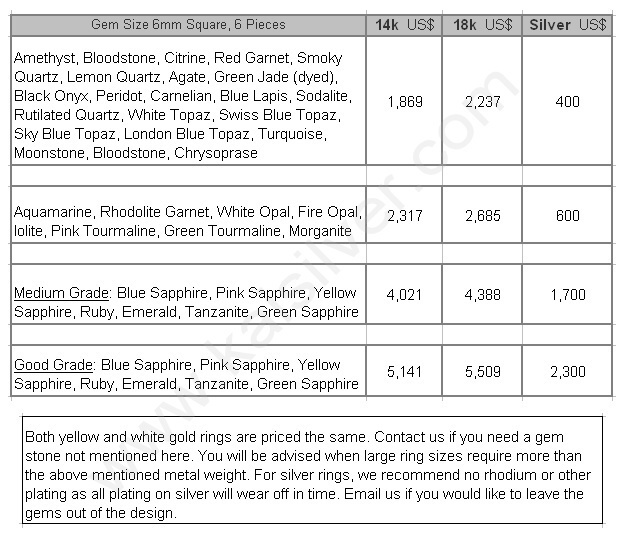 We can also accommodate requests for different gems to be mixed in the same ring, price quotes will be worked out for each combination. Different gems have different compositions, they also differ in terms of hardness, color and toughness. For example sapphires are more durable as compared to emeralds etc. The design provided for this gemstone band ring, is optimized for all gemstone types. Tips And Notes: If this men's band is being ordered as a wedding ring, consider alternating the birthstones of the bride and bridegroom in the ring. Birthstone engagement and wedding rings add a touch of special meaning to the jewels. You could also request for round and square gems to be alternated in the ring, this can enhance the style statement made by the ring. Consider white, yellow or pink gold and relate the gold color to the contrast that they would deliver with the gem color. If you wish to have this ring made as a diamond ring, you should know that diamonds are expensive. Discuss your requirements with our experts, we could suggest 4mm square diamonds and a slight reduction in the band width of the ring. If you need to combine gems and diamonds in the same ring, it might be a good idea to go for 6mm square gems and 4mm round diamonds. The band width in this case can remain at 10mm. How To Buy: It is never a good idea to make an impulse purchase when it comes to fine jewelry. Discuss your requirements with Kaisilver experts at sales@kaisilver.com . The team will update you with suggestions and options, there is no obligation on your part to make a purchase so do not hesitate to seek as much information as you require. We can also custom make jewelry as per your design concepts, there is no limitation on design or gemstones. Email us with sketches or images if you are interested. Payments can be made through Paypal or Western Union, we recommend Paypal for first time buyers. Let us know which mode you prefer and we will provide details for the same. The entire production process takes 4 to 6 weeks from the date of order confirmation and receipt of payment. Shipment is done through FEDEX with web tracking, you will receive the tracking number the moment the parcel ships.